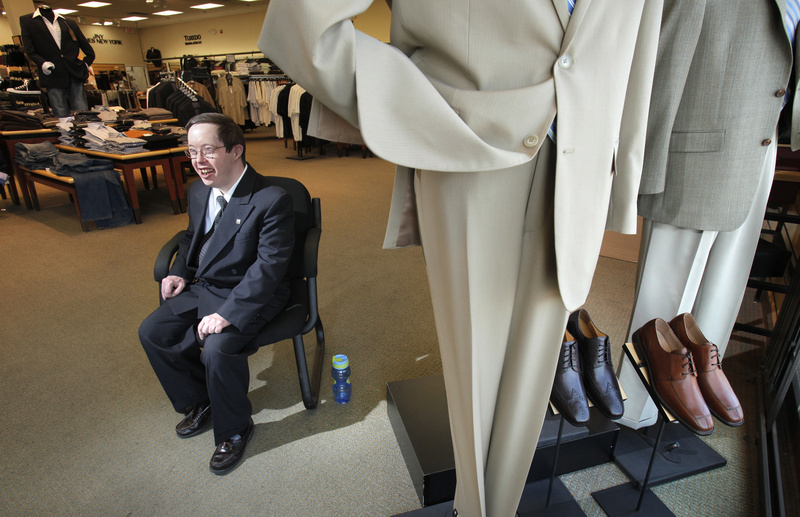 The disabled man loves to dress up and socialize, and the business loves his enthusiasm as its official greeter. SOUTH PORTLAND — Jimmy Gendron is as happy as a clam. Twice a week, he breaks out his crisp white shirt and perfectly knotted necktie, dons his charcoal, pinstriped, double-breasted suit, slips into his spit-shined penny loafers (complete with the pennies) and heads for his appointed position just inside the entrance to Men’s Wearhouse off Running Hill Road. “Good afternoon!” he exclaims to every customer who walks in during his 2½-hour shift each Monday and Wednesday afternoon. 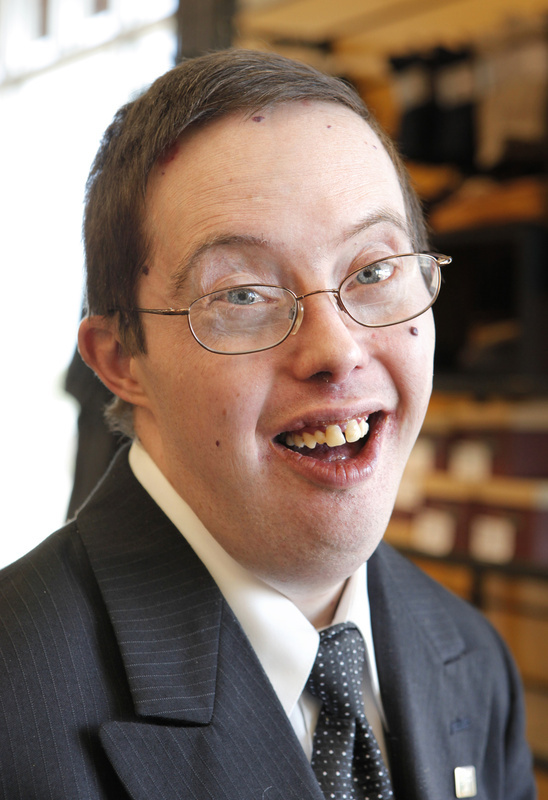 Jimmy, 41, has Down syndrome. And if you think that keeping guys like him active and engaged in society is a job for only government-funded social service agencies, think again. Indeed. Jimmy, it turns out, is the only greeter in the 1,200-store Men’s Wearhouse chain. And, it also turns out, he’s a favorite of company owner and founder George Zimmer (known to most of us as the guy on TV who says in his baritone voice, “You’re going to like the way you look. I guarantee it.”). It all started seven years ago. Jimmy, who had held a few similar jobs in years past, was out of work and attending the day services program at Creative Work Systems, a Portland-based agency that since 1967 has quietly provided group homes, job placement and other support to hundreds of people with disabilities all over southern Maine. “His self-esteem had just plummeted,” recalled Terri O’Brien of Saco, Jimmy’s mother, who has known since he was a child that Jimmy is at his best when he’s around people. That charm was not lost on Tenney Swift, who back in 2003 was an art specialist at Creative Work Systems. She was a friend of Dickerson, who at the time managed the Men’s Wearhouse store. Jimmy didn’t miss a beat. “Seven hundred dollars,” he replied. Dickerson finally suggested a figure – still well above minimum wage – and asked if Jimmy could live with it. The rest is Men’s Wearhouse history. Dickerson e-mailed Zimmer, who immediately put Jimmy on the payroll as the Men’s Wearhouse’s first – and still only – store greeter. And there on the payroll, through good times and bad, Jimmy has stayed. He’s the guy who begins each shift by bestowing a hug on every female employee in the store. They love it. He’s also the guy who, if not for a company that measures true success by more than its bottom line, would go each day from his group home in Scarborough to his day program in Portland with little if any contact with the business world he so clearly worships. The feeling, in this little slice of the retail sector, is clearly mutual. Men’s Wearhouse is but one of 15 businesses in Cumberland County alone that now employ Creative Work Systems clients. The others are the Maine Red Claws, Hannaford and Shaw’s supermarkets, Unum, Kohl’s, Amato’s, Bass Shoe Outlet, Big Lots, Marshall’s, On the Border, Toys “R” Us, T.J. Maxx, Whole Foods Market and the Workout Fitness Store. The disabilities run the gamut, said Scott Ferris, Creative Work Systems’ program manager for employment services. Some of the workers function independently, he said, while others work alongside “coaches” assigned and paid for by the agency. Jimmy, who has a heart condition and was diagnosed recently with hypoglycemia, needs a coach nearby for all of the five hours he works each week. It’s not because he can’t handle the job, but because his medical conditions occasionally cause him to keel over without warning. More than once, his seizure-like spells have necessitated calls to 911. That it is – despite what the insurance carriers, the liability lawyers and other skeptics might say. If there’s one thing in this store that defies a price tag, it’s the look on Jimmy’s face when an incoming customer lights up, shakes his hand and tells him it’s nice to meet him too. And would he mind marking the occasion by posing for a picture? One more thing about Jimmy’s wardrobe. Attached to his double-breasted jacket is a small gold pin. He got it two years ago, on his fifth anniversary as a Men’s Wearhouse employee – and he’s not shy about telling visitors what it signifies. “I love my job,” Jimmy said, flashing his trademark smile.